Although usually classed as a plum, Denniston's Superb is clearly related to the Reine Claude group of plums also known as gages and has been classified as such in the past. It is perhaps best considered as a gage-like plum. The plums are fairly small, round, and green - just like a green gage. Considered by the Victorian writer Hogg as "a first-rate dessert plum". The flavor also has the honeyed-sweetness which is characteristic of gages. The only downside is the skin, which can be slightly tough, and for cooking is best removed by blanching. 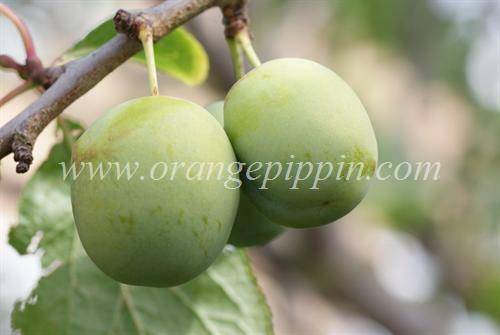 Although the fruit resembles a green gage, Denniston's Superb grows more like a plum tree, with good disease resistance and it is generally a good cropper. This combination makes it a good choice for the gardener who wants gage-like fruit without the horticultural difficulties often associated with gages. I have two Dennistons Superb trees. The fruit they produce is green until July but then turns a golden green/yellow, almost becomming translucent as the fruit ripens in early August. The ripe fruit can't really be described as green and the photo is of unripe fruit.